We will hold try outs for the 2019 12u Generals on Friday, August 17th at Miami Riverview from 6pm until completed (likely 7:30pm). Please register on lybo.org if you did not play with the 11U Generals this past season. Hope to see you there! In 2013 a number of coaches sought to make our LYBO players more competitive and improve their development/experience. What began as recreational-plus program has turned into an affiliate/select program still with requirements on our game schedule and boundaries… we like that as it give us small-town feel but big-time talent. Players are required to live within our LL boundaries and play the minimum twelve LL D9 games. During winter of 2013-14 the Loveland Generals were branded and began play in spring 2014. At that time, all Generals players were required to play on an in-house rec team also. We wanted talented Loveland players to continue to play with and against their friends, neighbors and classmates. Also, this would give those players a less expensive option than “travel” baseball and an opportunity to play home games in Loveland. Since then the LYBO board has allowed one Generals team at each age group to be excused from the rec requirement to focus on an enhanced schedule... all other teams players play in the rec league with Generals games on Friday and Sunday. IMPORTANT: Unless the LYBO Board deems a 2ndndteam at an age group as “highly competitive” that teams players will be required to play on a rec team in addition to on the Generals team. Playing for the Generals requires a great amount of dedication & responsibility. -Remember one goal of the Generals program is to prepare players for selection to tournament play in July. While no player is guaranteed a spot, they are expected to be prepared to play… therefore if your family vacations in July then the program most likely is not for your son. -If your son plays another sport in the spring (soccer, track, flag football, etc) please do not take a spot from a player dedicating his time and efforts to baseball. We recommend playing multiple sports over the year, just not during same season. -Be prepared to play a 25-35 game schedule in addition to practices. You will be notified via email if your son is being invited to a callback… if not invited this does NOT mean he may not be invited to play on a team. We are all for every player to get as many swings, throws, catches.. as possible in a spring/summer. Not making callbacks means your son will NOT be on a Generals “out-of-house” team. He could still play both rec and on a Generals in-house team. Those teams will begin formation later this fall. -Please have your son wear baseball pants, a jersey from this year or previous season, hat, and protective cup is always part of mandatory equipment.… bring plenty of water. -Parents MUST drop their son off or view from football bleachers.. please do not hang around outfield fences or backstops.. Personally, I thank all of you & your sons for choosing LYBO.. we continue to strive to find a place to play for players of all talent levels. Each one of you that chooses LYBO helps strengthen community baseball that much more. Here's the info for tryouts: Loveland Generals 12U age division (D.O.B. 5/1/05 - 8/31/06) will be holding tryouts for the 2018 season at Miami-Riverview Park on June 25th from 5:00pm-7:00pm. 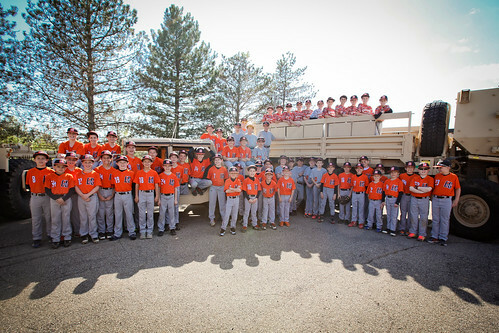 The Loveland Generals is a select organization affiliate of the Loveland Little League organization playing District 9 competition with the goal of preparing players for the highest level of competition.